1. A person who tries to steal information from computer systems is called a ______________________ . 2. The name of the search engine "Google" derives from _______________ . 3. Spam _______________________ communication over the Internet. 4. The tail of a computer mouse is __________________________ . 5. A web page that contains pictures, comments, stories, or lessons is called a _______________ . 7. When you say, "Let's google Mission Language Lab", you're using "google" as a ___________________ . 8. 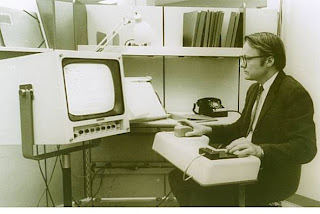 The first computer mouse in the 1960s was made of ___________________ . 10. A shortened name for web log is _________________________ . Using "gmail" from Google. You will hear, "Hey, good shot." Meaning, "good job."